Some news and notes from around the ACC in recent days. Terrell McIntyre was named Director of Player Development on Brad Brownells staff at Clemson. McIntyres’ legendary status in Death Valley is warranted as he is the 2nd all time leading scorer (1839 points), 2nd in 3pt FG made (259), 3rd in assists (577), and 4th in steals (194) for the Tigers. Martin Geben was named to the Lithuanian student national team for the FISU Network Competition. The 6’9 255 pound center averaged 3ppg and 3 rpg for Notre Dame in 2016-17. 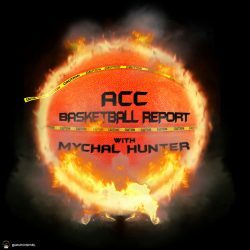 Top 150 guard out of Florida, Michael Devoe cut his list to 8 including 3 ACC programs, Wake Forest, Georgia Tech, and Clemson. USC, UConn, Ohio St, Florida and Indiana also made the cut. Florida widely considered the favorite. Wake Forest All-time leading scorer and rebound Dickie Hemric passed away Thursday, August 3rd. Hemric averaged 24.9 points and 17.3 rebounds for his career in the early to mid 50’s. His point total was the highest in ACC history until Duke sniper JJ Redick surpassed him in 2006. Grayson Allen had surgery on an ankle in late May. Duke expects him to be fully recovered for the season. Pitt hosted 2018 wing Saddiq Bey on 8/5 and also had big man Kenechukwu Chukwuka on campus on 8/6. Bey is a 6’7 185 lb top 100 wing out of Washington DC. Bey took an unofficial to NC State in late June. A trio of ACC programs went on international trips this week to take advantage of some early practice and scrimmages. Programs are allowed to travel internationally and play once every four years. FSU has headed to Jamaica where they will play 3 games and will be allowed to conduct 10 practices. Its a good time for Hamilton to take this trip as the Seminoles have 10 underclassman including 5 true freshman for the 17-18 campaign. He needs to get a head start on the underachieving. They will play the Jamaican Select team twice and the Jamaican U21 national team. NC State is in Italy and played the Varese All-Stars on Saturday. They cruised to a 100-64 victory, led by graduate transfer Al Freeman who had 17 points. The Wolfpack had 5 additional players in double figures. NC State starters: Abu, Freeman, Freeman, Dorn and Hunt. Duke is heading to the DR to play the Dominican national team twice. Lastly, in a development that can only make sense to NCAA officials, or possibly programming directors at ESPN, Braxton Beverly, a freshman at NC State, may be required to sit out the 17-18 season because he took summer classes at Ohio State. Beverly was originally a Buckeye commit but transferred after the firing of Thad Matta. The NCAA is now punishing kids for actually attending classes. UNC had the right idea apparently.